Summer drags on in the US. You’d think that they would have the odd cold day just to mix it up a bit, wouldn’t you? But no. They have a storm here and there, but sadly when this happens it tends to rip the tops of people’s houses off and flood the entire town and make everything even more humid. So, I’ve been here four and a half months now (fanfare please) I’m allowed to work! Sadly, being allowed to work and getting work are two entirely separate things. But, my adventures in job hunting have taken me to Hollywood, Florida and New York City. Depressingly, I have now seen more of the country than the average American. I recently got back from New York, which is really the city of all cities and feels a lot more European than your average American city. So it was quite a shock to come crashing back to American weirdness in the Midwest and go out to the local Renaissance Fair. 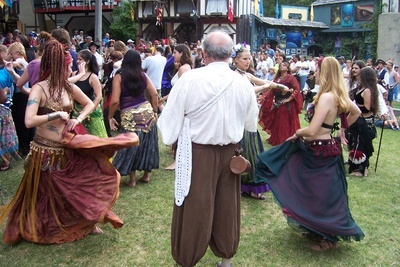 A Renaissance Fair (or should I say “Fayre”?) 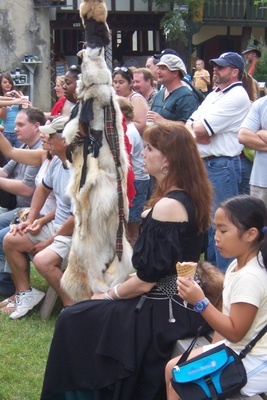 is something that happens all over the country in the summer time and is a fake medieval village, which pretends it is in medieval times and has medieval shops, jousting tournaments, falconry and medieval style performances. What happens is this; you drive to this village and pay to go inside. Once inside all the staff are dressed in medieval clothing and are talking to you in bad British accents. That’s right, your eyes aren’t deceiving you, dear friend. It’s real enough. The general American public gets dressed up and walk around and pretend that they’re medieval British people as well as the staff. It’s almost impossible to tell who works there or doesn’t. It’s sweet in a way. Say what you like about Americans, but they’re “do-ers”. As a rule, we northern Europeans will not do anything that requires effort and has a risk of possible ridicule. Americans love it and will throw themselves into it full heartedly. 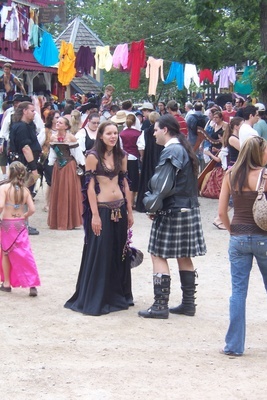 I mean, these people keep these medieval clothes and get them out once a year so they can go to the Renaissance Fair in full costume. I find it weird, but it’s just another thing to do in the year along with Halloween, St. Patrick’s Day, Easter and Christmas. After a while of walking around like I was in a bizarre dream, it was whilst staring at this woman’s pole covered in fur, that I realised what this is all about. It’s like a cross between a theme park and a craft fair rolled into one surreal package. When you look at it that way, it kind of makes sense… but not really. What is it? Well, it’s a mass belly dancing, tribal drumming and random screaming session. Why? Seriously, about 50 people all crowded together and dancing “sexily” to the beat of 15 drummers with no sense of rhythm and randomly screaming. I shook my head and left. But this was blocking the exit. I felt dizzy and sick. Maybe it was the ale, but I knew it wasn’t. 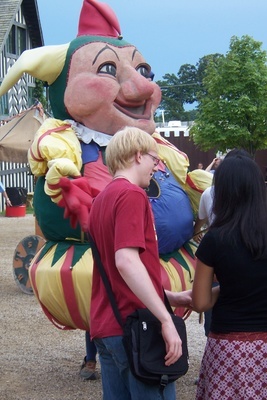 The giant jester turned to me and stared right into my frickin’ soul. I think I blacked out at this point. How I got home, I don’t know. Well, ok, my wife took me. But, it was pretty terrifying. But be afraid. Be very afraid. Are there shops in the US that sell furry poles because I want one!